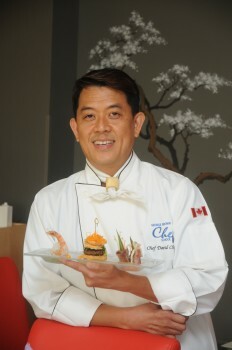 Chef David Chung of Akasaka holding one of his tasty creations. I can’t do an entire blog on Chef David and Akasaka without mentioning the wonderful gluten-free cooking classes we do together. 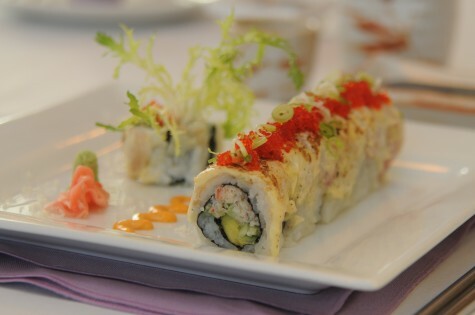 Chef David and I offer two different classes: a sushi class and a pad Thai and dumpling class. We do the classes around a Teppanyaki table at the restaurant. The class size is always small so everyone gets to spend ample time with both Chef David and myself, and the food we make is delicious (you get to keep the recipes!). I am so excited to be offering the classes again this year. We will be announcing all the details at the Gluten Free Garage and giving attendees first dibs at a chance to come to one of the classes. Plus, a special price will be offered to those who sign up at the GFG! Chef David is an amazing chef who really cares about the gluten-free community. I can’t say enough great things about a chef willing to take on all the challenges that come with a gluten-free diet and food allergies in general! Dr. JoAnne Bennett Mirsky, founder of Gluten Free Consultant, has dedicated the past five years to helping families and businesses adapt to the gluten-free lifestyle. She teaches people which foods are safe and how to read labels, organizes kitchens, takes people on shopping tours, offers recipes and cooking classes, and plans special events that revolve around food (such as birthdays and religious holidays). A chiropractor by profession, Dr. Mirsky owned and operated two chiropractic clinics before becoming a gluten free consultant. Throughout her undergraduate education, she pursued a number of courses in nutrition at the University of Western Ontario. As a student of the Canadian Memorial Chiropractic College, she won the Drs Phillip and Laura Martin Nutrition Award for the highest academic achievement in clinical nutrition. Dr. Mirsky’s education gives her the scientific background and knowledge to provide accurate information with respect to celiac disease and the gluten-free diet. She became involved in the gluten-free lifestyle when her daughter was diagnosed with celiac disease at a young age. Being a member of a family with gluten-free needs helps Dr. Mirsky relate to others living the gluten-free lifestyle and ensures that her information is up to date.